Conference attendance is an important part of an academic’s work, offering opportunities to present and receive feedback on recent research, and also to make new connections and expand professional networks. When deciding whether or not to attend an event, the cost of travel or having an abstract accepted remain the determining factors to many. But for some, as Donald Nicolson writes, more restrictive border policies have meant securing a visa and obtaining clearance to attend international events can be difficult or even impossible. This problem represents an inequality in access to conferences, and is one that may well worsen as mobility rules change. For some conference goers, border security has become just as important a hurdle to clear as having one’s abstract accepted, or travel fares paid. Two years ago, using an anecdotal example, I considered how border security might deter some people from travelling internationally to attend or present at conferences. Today I am not surprised that with each passing week more and more academics are reporting how border security in the UK and elsewhere is impacting on their academic conference attendance. Just as international affairs must be understood in relation to geography, I believe the same applies to international academic conference attendance. There is clear evidence that border security is already stopping academics from attending events in the UK. In 2016 the African Studies Association UK held a conference at the University of Cambridge. The ASAUK website documented the cases of five scholars who were denied visas to attend and present at the conference. Three were senior scholars, while two were junior academics with scholarship awards. All had sufficient funds and the support of their universities to attend. Correct documentation was provided in a timely manner, but four people were given dubious reasons for refusal. For example, barrister Christiana Ejura Attah was refused entry because the embassy official was concerned she would not leave the UK as her husband had also travelled and been given a visa for the same conference. This was far from an isolated incident. Invited to perform at an event held as part of a UK-government funded academic project, musicians and dancers from Ghana were refused visas and so were unable to travel. According to one report in The Glasgow Herald, restrictions were being applied to those visitors border security officials suspected might attempt to remain in the UK, especially those from Middle Eastern and African countries. To Professor Alison Phipps, UNESCO Chair in Refugee Integration at the University of Glasgow, who invited the performers from Ghana, this incident suggested UK policy was worse than President Trump’s travel ban in the USA and that it discriminated against people from global south countries. Prof Phipps even went so far as to suggest there is now a “secret travel ban” in place in the Home Office. Border security is not just affecting conference attendance. Yasin Koc, originally from Turkey, lived in the UK for four years, with seven previous UK visas, and now works at the University of Groningen in the Netherlands. He told me how in July 2018 he faced undue delay while awaiting a priority-service visa to attend his PhD graduation ceremony in England, causing uncertainty, concern, and avoidable aggravation: “With the pressure from the University of Sussex, thanks to the Vice Chancellor, UK Visas and Immigration reported they had approved the visa, but they only sent the passport out three days before the trip to London (which was also at the weekend)”. Yasin was able to attend his ceremony in the end, but only after an anxious wait. Image credit: Passport control, UK Border by Eric Fischer. This work is licensed under a CC BY 2.0 license. Neither is this problem unique to the UK. At the Lancet Palestinian Health Alliance conference, held in Beirut (Lebanon) in March 2018, 13 prospective presenters from Gaza were refused permits to travel through Israel and Jordan on to Beirut. Only 2 of 15 Gaza presenters succeeded in obtaining the three types of permits required to get to Lebanon: the permit from Israel to cross from Gaza through Israel to the West Bank on their way to Jordan; the permit to enter Jordan to be able to travel to Lebanon; and the Lebanese visa to enter the country. In addition, a member of the conference steering group revealed that another five Palestinian participants were denied entry to Lebanon after traveling from France, USA, UK, Abu Dhabi, and the West Bank respectively for having violated rules on how to enter Lebanon. More recently, while attending the Association for Borderland Studies conference in Vienna last month, I learned that an unconfirmed number of people registered for the conference were refused a visa by Austrian Immigration. In seeking to understand why this happens, it is useful to recall Bauman, who proposed that the military concept of “collateral damage”, referring to unintended and damaging consequences arising from armed conflict, can also be used to explain contemporary social inequality. My contention is that this also shows how the border has become an insurmountable barrier to academic conference attendance – not necessarily as an intentional act on the part of governments, but rather as an incidental effect of a more general border security policy. The second decade of the 21st century has not been kind to sectors of academia in the UK. Universities have been besieged by the austerity policies of the coalition government, while commentators have argued that there has also been an attack on the humanities during the same time. The conference-border problem represents a further challenge to be overcome. Considered as a whole, these events might be seen as indicative of a growing tension between academia and the government. 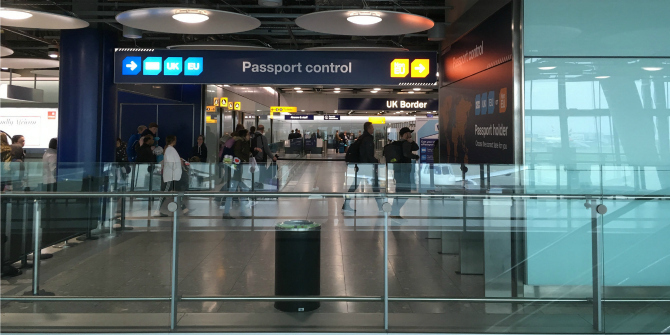 The possible end of freedom of movement in the UK after Brexit would present a significant increase in demand for visas for academics and others. EU citizens’ need for visas to attend conferences in the UK post-Brexit would only swell the number of applicants and further increase demands on the Home Office. (Similarly, in EU countries there would be increased demand for visas caused by UK nationals applying to enter the EU). This problem represents an inequality in access to conferences for people trying to enter the UK and other countries. It is essential that the academy documents such cases, whenever and wherever they occur, to highlight these injustices. Donald Nicolson has worked in academic research since 2001 and is an independent scholar again, (go figure). He recently gave an invited keynote address the Association for Borderland Studies conference in Vienna, from which this piece arose. He can be approached on Twitter @the_mopster. His first book, Academic Conferences as Neoliberal Commodities, was published by Palgrave Macmillan. Some people think it is not bad.